This section is designed to help our users understand the goals behind the OhBabyNames website as well as provide assistance to the navigation process. 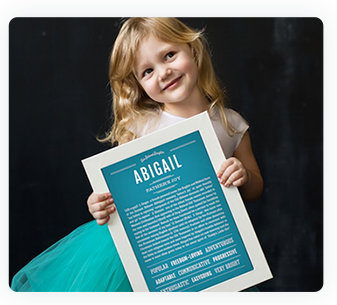 In essence, we started with the Top 2000 baby names in use today which is comprised of the Top 1000 girl names and the Top 1000 boy names. Based on data provided by the Social Security Administration we were able to determine that roughly 70%+ of new parents will choose one of these 2,000 monikers when naming their baby boys and girls. That number is even higher for boys (American parents are more creative and inventive when naming their daughters so there are often names chosen which are given to so few girls that the name won’t appear on the popularity charts). Regardless, if parents plan to make-up or invent a name, then we can’t really help you anyway. Rather, this site has been created to provide detailed information on names which have the highest propensity for use. Having said that, what do we do about the roughly 25-30% of parents who don’t plan on using one of the 2,000 most popular names in use today? Truth be told, we actually have about 7,000 names in our database which we activate on an individual basis based on user interest and demand. There are also names which have never been used by mainstream America (and therefore have never shown up on the U.S. charts in the 120+ years the government has been tracking naming trends), yet we still find them worthwhile to add based on uniqueness or historical significance (some obscure mythological names, for instance). We are also focused on Western names, and are therefore unable to accommodate on a wide scale parents interested in Eastern names rooted in Asian languages, Hindu tradition, African or Arabic names, for example. Still, given the growing ethnic populations within the United States, many such names are incorporated into the Top 2000 and therefore available on a small scale. Overall, we attempt to provide a valuable service to at least 80% of parents who bring roughly 4,000,000 new babies into the country each year. Below is more information about the components of our website which we hope will offer some assistance as you navigate through the name choices. Almost every name is rooted in some etymological meaning. That is, the root of the name means something very specific. The discipline of etymology is not always straightforward as any linguist will tell you: languages are complex and the cross-mingling of cultures and languages over many millennia has sometimes blurred these lines. This is why we felt it was important to research every single name individually and, more importantly, manually. Though we are ultimately amateur etymologists, we still applied rigorous discipline to our research. We double-checked and cross-checked the validity of our sources. We wanted to feel confident that the information we provide to our users is accurate and correct. In the instances where we were uncertain, we say so. With many names, there are usually one or two (or perhaps more) significant influences behind its propulsion in usage. In most cases, our research would uncover some such impetus behind the name’s popularity (or even its diminished usage). In terms of each name’s popularity in America specifically, we have a whole section on that subject for each name. This also includes a visual graphic of the name’s historic usage in the United States in the past 100+ years. This is a point of interest. Naming fashions and fads change over time, so what was most popular in 1900 vs. 1950 vs. 2000 will sometimes astound you. The earliest and most dominant force in Western naming traditions has unequivocally been influenced the Judeo-Christian belief system. To put it more simply: the Bible. Since the Old Testament (or Hebrew Bible) was written in Hebrew and the New Testament in Greek, many names most familiar to the Western ear are rooted in these two languages. Such names became Latinized thanks to the expansion of the Roman Empire and eventually anglicized as the English language developed over time. During the Middle Ages, names of early popular saints, around whom cults and legends grew, were also used heavily in homage to their holy sacrifices (as well as a protective measure for child namesake). Most of the common names we hear which have been around since Antiquity and the Middle Ages have Biblical or saintly significance. Yet there are also contributions from the Celtic, Germanic and Slavic languages (as opposed to just Hebrew, Greek and Latin). Some names are strongly associated with particular characters from literature or certain significant historical figures. There are also names featured prominently in song and/or children’s books. We provide our users with this information when pertinent which offers more color and imagination to certain names. We also tried to catalog certain names into fun categories. 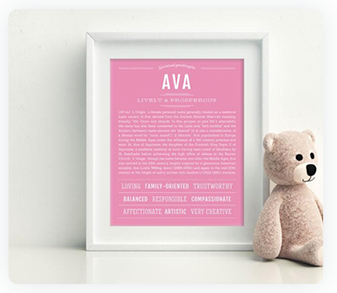 See our Unique Ideas for Baby Names section. This sometimes helps minimize the overwhelming amount of choices by showcasing certain names within certain meaningful categories. 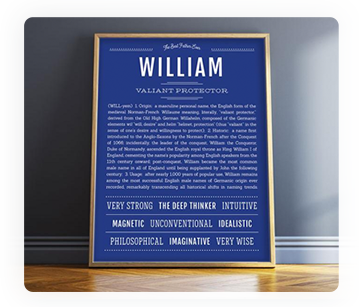 You’ll notice each name page identifies each name with a specific set of personality traits and qualities. We basically used the quasi-science of Numerology to determine these characteristics. Every given name has a numerology output based on a specific calculation, and every output has certain personality traits associated with it. You don’t have to believe it, but it’s another interesting way to render a name’s overall colorful portrait. Plus, we believe in the general vibrations of the universe and subconscious connections, so why not add another small component of fun. All names have some origin. For instance it could be the Spanish version of a Greek name or the English version of a Hebrew name. As an example: the Hebrew Miriam produced the English name Mary, and Mary has been altered to Maria, Marie, Mariah, Malia, Molly and so forth. John is another perennial favorite which became Sean (Irish), Ian (Scottish), Owen (Welsh), Ivan (Russian), Johan (German), Giovanni (Italian), Juan (Spanish) and Jean (French). You get the picture. We tried our best to determine the root origin and then provide a potpourri of linguistic variations. The Baby name Origins section of our website gives a historic snapshot of various cultures which we hope will add some more color and clarity to a name’s importance within each respective ethnic culture. We suggest you use the Advanced Search section in an effort to strip down your preferences and get to the heart of your interests. In this area, you can select gender, number of syllables, ethnic origins, first letter of names and even a preferred numerology number depending on your desired personality. Now instead of sifting through thousands of choices on the general site, you can filter down to a list of fewer, more meaningful names from which to peruse and hopefully make a selection with greater ease. We provide extra benefits to our Members who sign up (don’t worry, it’s free). We just ask for a few pieces of information (user name, password, etc). Once you become a member and log-in to the site, you’ll have your own Member Page. This is where you can manage a list of your favorite names. The member area also lets you see what the full name looks like when you enter a middle and last name. This way, you can make sure not to end up with the initials A.S.S. or something unfortunate like that. You can also do a full numerology calculation on baby’s full name (for a more accurate Destiny Number). When you become a member, you can also make comments on the name pages – which we hope you do! Peoples’ comments are often very helpful to other Moms or Dads thinking about a certain name.